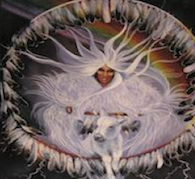 White Buffalo Calf Woman is one of the most revered deities among the Native Americans in the United States. A beautiful young woman who appeared to a young warrior as a white buffalo calf, White Buffalo Calf Woman was a wholly benevolent figure, for it was she who gave The People the peace-pipe and provided the teachings that allow them to respect and live in harmony with all things. White Buffalo Calf Woman instructed the people to be responsible caretakers of the land and to always be mindful that the children are the future of the people. After White Buffalo Calf Woman brought her message appearing as a woman, she stood up and was a white buffalo again. She walked on until she was a bright speck in the distant prairie, then rolled over and became a black buffalo. This buffalo walked away, stopped, bowed to the four directions of the Earth and finally disappeared over the hill. The opening of the sacred energies from Great Spirit is now pouring into Mother Earth as never before. You as Rainbow Warriors have prepared your whole lifetimes to assist with this. Your paths are honored and your inner work and service to all, especially Mother Earth is bringing the energies to return. You are remembering your origins. As the energy shifts love returns to the heart. What is not of heart energy is and will be removed off of Mother Earth. Only the energies of love from the heart will remain and be sustained by the Great Spirit of Light. The manual includes a lovely meditation to connect you to the energies of White Buffalo Calf Woman and the Sacred Ways.